This article is about the road junction. For other uses, see Roundabout (disambiguation) and Rotary (disambiguation). A roundabout (also called a traffic circle, road circle, rotary, rotunda or island) is a type of circular intersection or junction in which road traffic is permitted to flow in one direction around a central island, and priority is typically given to traffic already in the junction. Modern roundabouts observe various design rules to increase safety. Compared to stop signs, traffic signals, and earlier forms of roundabouts, modern roundabouts reduce the likelihood and severity of collisions greatly by reducing traffic speeds and minimizing T-bone and head-on collisions. Variations on the basic concept include integration with tram and/or train lines, two-way flow, higher speeds and many others. Traffic exiting the roundabout comes from one direction, rather than three, simplifying the pedestrian's visual environment. Traffic moves slowly enough to allow visual engagement with pedestrians, encouraging deference towards them. Other benefits include reduced driver confusion associated with perpendicular junctions and reduced queuing associated with traffic lights. They allow U-turns within the normal flow of traffic, which often are not possible at other forms of junction. Moreover, since vehicles on average spend less time idling at roundabouts than at signalled intersections, using a roundabout potentially leads to less pollution. When entering vehicles only need to give way, they do not always perform a full stop; as a result, by keeping a part of their momentum, the engine will produce less work to regain the initial speed, resulting in lower emissions. Research has also shown that slow moving traffic in roundabouts makes less noise than traffic that must stop and start, speed up and brake. Modern roundabouts were first standardised in the UK in 1966 and were found to be a significant improvement over previous traffic circle and rotaries. Since then they have spread and modern roundabouts are commonplace throughout the world. :2 Half of the world's roundabouts are in France (more than 30,000 as of 2008), although the United Kingdom has more as a proportion of the road than any other country. Circular junctions existed before roundabouts, including the Circus in the city of Bath, Somerset, England, completed in 1768, part of a world heritage site; the 1899 Brautwiesenplatz in Görlitz, Germany; the 1907 Place de l'Étoile around the Arc de Triomphe in Paris; the 1904 Columbus Circle in Manhattan; and several circles within Washington, D.C. The operating and entry characteristics of these circles differ considerably from modern roundabouts.[how?] French architect Eugène Hénard was designing one-way circular intersections as early as 1877. American architect William Phelps Eno favored small traffic circles. He designed New York City's famous Columbus Circle, which was built in 1905. In 1907, architect John McLaren designed one of the first American roundabouts for both autos and streetcars (trams) in the Hanchett Residence Park in what is now San Jose, California. The first British circular junction was built in Letchworth Garden City in 1909. Its centre originally was intended partly as a traffic island for pedestrians. It was featured in the film The World's End. In the early 20th century, numerous traffic circles were constructed in the United States, particularly in the northeast. Examples include a circle in Atherton, California. Other circular intersections were subsequently built in the United States, though many were large diameter 'rotaries' that enabled high speed merge and weave maneuvers. They may control entering traffic by stop signs or traffic lights. Many older traffic circles allow entry at higher speeds without deflection, or require a stop and a 90-degree turn to enter. These designs were doomed to failure for two primary reasons. The first is that it takes a large diameter circle to provide enough room for merging at speed. Although some of these circles were huge (many were in excess of 100 meters or 300 feet in diameter), they were not large enough for high-speed merging. Secondly, giving priority to entering traffic means that more vehicles can enter the circulatory roadway than it can handle. The result is congestion within the circle which could not clear without police intervention. The experience with traffic circles and rotaries in the US was almost entirely negative, characterised by high accident rates and congestion problems. By the mid 1950s, construction of traffic circles and rotaries had ceased entirely. The experience with traffic circles in other countries was not much better until the development of the modern roundabout in the United Kingdom during the 1960s. Starting in the 1990s the US saw a revival of mostly smaller traffic circles, termed "roundabouts". The modern roundabout finally arrived in the United States in 1990 in Summerlin, a major Las Vegas residential subdivision. As of December 2015 there are about 4800 of these modern roundabouts in the United States. As an example, Washington State contains about 120 roundabouts as of October 2016, all having been built since 1997 with more planned. Widespread use of the modern roundabout began when the UK's Transport Research Laboratory engineers re-engineered and standardised circular intersections during the 1960s. Frank Blackmore led the development of the "Priority Rule" and subsequently invented the mini-roundabout to overcome capacity and safety limitations. The priority rule was found to improve traffic flow by up to 10%. The design became mandatory in the United Kingdom for all new roundabouts in November 1966. This give-way requirement has been the law in New York state since the 1920s. In the United States modern roundabouts emerged in the 1990s. Municipalities introducing new roundabouts often are met with some degree of public resistance, just as in the United Kingdom in the 1960s. Surveys show that negative public opinion reverses as drivers gain experience with roundabouts. American confusion at how to enter and especially how to exit a roundabout was the subject of mockery such as featured in the film European Vacation and the television series The Simpsons. By 2011, however, some 3,000 roundabouts had been established, with that number growing steadily. A 1998 survey of municipalities found public opinion 68% opposed prior to construction; changing thereafter to 73% in favour. A 2007 survey found public support ranging from 22% to 44% prior to construction, and several years after construction was 57% to 87%. The first modern roundabout in the United States was constructed in Summerlin, Nevada in 1990. This roundabout occasioned dismay from residents, and a local news program said about it, "Even police agree, [roundabouts] can be confusing at times." As of the beginning of the twenty-first century, roundabouts were in widespread use in Europe. For instance, in 2010 France had more than 30,000 roundabouts. Roundabout under construction in Ystad 2017. DeSoto Fountain sits in the center of a traffic circle in the City of Coral Gables, Florida. The arterial, DeSoto Boulevard, has unrestricted right of way, while the intersecting streets are controlled by stop signs. Traffic 10-abreast traverses the Place de l'Étoile. This traffic circle surrounds the Arc de Triomphe at the intersection of ten two-way and two one-way streets. It has no lane markings. Europe (right-hand traffic); in the UK a similar sign, with the arrows reversed, is used at mini roundabouts. The US, Canada and Mexico (right-hand traffic); a similar sign is used in Ireland (with directions reversed). A "modern roundabout" is a type of looping junction in which road traffic travels in one direction around a central island and priority is given to the circulating flow. Signs usually direct traffic entering the circle to slow and to give way to traffic already on it. Because low speeds are required for traffic entering roundabouts, they are physically designed to slow traffic entering the junction to improve safety, so that the roads typically approach the junction radially; whereas rotaries are frequently designed to try to increase speeds, and thus have roads that enter the traffic circle tangentially. Because of the requirement for low speeds, roundabouts usually are not used on controlled-access highways, but may be used on lower grades of highway such as limited-access roads. When such roads are redesigned to take advantage of roundabouts, traffic speeds must be reduced via tricks such as curving the approaches. Many traffic circles have been converted to modern roundabouts, including the former Kingston traffic circle in New York and several in New Jersey. Others have been converted to signalised intersections, such as the Drum Hill Rotary in Chelmsford, Massachusetts, which is now six lanes wide and controlled by four separate intersections. The word roundabout dates from early 20th century United Kingdom. In U.S. dictionaries the terms roundabout, traffic circle, road circle and rotary are synonyms. The U.S. Department of Transportation adopted the term modern roundabout to distinguish those that require entering drivers to give way to others. This article follows that convention and refers to other types as traffic circles or rotaries. Many old traffic circles remain in the northeastern US. Some modern roundabouts are elongated to encompass additional streets, but traffic always flows in a loop. In the United States, traffic engineers typically use the term rotary for large scale circular junctions between expressways or controlled-access highways. Rotaries typically feature high speeds inside the circle and on the approaches. In New England, traffic circles are generally called rotaries and the traffic that is already driving in the rotary always has the right of way. For examples of where this is specified, in Massachusetts "Any operator of a vehicle entering a rotary intersection shall yield the right-of-way to any vehicle already in the intersection." In Rhode Island entering vehicles "Yield to vehicles in the roundabout." The term traffic circle is not used in the United Kingdom, where most circular junctions meet the technical criteria for modern roundabouts. However, in some parts of the English Midlands, such as in Birmingham, roundabouts are commonly called "islands", which conflicts with the more generic use of the term "island" as a structure to divide traffic flow, and can cause confusion. In the Channel Islands a third type of roundabout, known as "Filter in Turn", exists. Here approaching drivers neither yield to traffic on the roundabout, as normal, nor have priority over it (Traffic circle), but take it in turns to enter from each. Almost all of Jersey's roundabouts are of this type. In the Philippines, the term rotunda or rotonda is used in referring to roundabouts. The fundamental principle of modern roundabouts is that entering drivers give way to traffic within the roundabout without the need for traffic signals. Conversely, older traffic circles typically require circling drivers to give way to entering traffic. Roundabouts may also have an interior lane. Generally, exiting directly from an inner lane of a multi-lane roundabout is permitted, given that the intersecting road has as many lanes as the roundabout. By contrast, exiting from an inner lane of an older traffic circle is usually not permitted and traffic must first move into the outside lane. Vehicles circulate around the central island in one direction at speeds of 25–40 km/h (15–25 mph). In left-hand traffic countries they circulate clockwise (looking from above); in right-hand traffic, anticlockwise. Multi-lane roundabouts are typically less than 75 metres (250 ft) in diameter; older traffic circles and roundabout interchanges may be considerably larger. Roundabouts are roughly the same size as signalled intersections of the same capacity. Right-of-way: Whether entering or circling vehicles have the right of way. The New Jersey Driver's Manual recommends that, in the absence of flow control signs, traffic yields based on "historically established traffic flow patterns", and there are no set rules. In New England, Washington, D.C. and New York State, entering traffic yields, as is the norm in virtually all countries outside of the U.S. Angle of entry: Angles range from glancing (tangential) that allow full-speed entry to 90 degree angles (perpendicular). Traffic speed: High entry speeds (over 30 mph or 48 km/h) require circulating vehicles to yield, often stopping, which lowers capacity and increases crash rates compared to modern roundabouts. Diameter: The greater the traffic, the larger the circle. Island function: Parking, parks, fountains, etc. Modern roundabouts feature a central island and sometimes pedestrian islands at each entry or exit. The central island may be surrounded by a truck apron that is high enough to discourage drivers from crossing over it, but low enough to allow wide or long vehicles to navigate the roundabout. The island may provide a visual barrier, to encourage drivers to focus on the traffic in the path of the circle. Otherwise, vehicles anywhere in or near the circle can cause those entering to stop and wait for them to pass, even if they are opposite, which unnecessarily reduces traffic flow. The barrier may be a landscaped mound, a raised wall, a tree or tall shrubs. Road signage or flagpoles may be erected at the top of a landscaped mound. Some communities use the island for monuments, the display of large public art or for a fountain. Pedestrians may be prohibited from crossing the circling lane(s). Access to the central island requires an underpass or overpass for safety. Bend, Oregon (United States); Bend's Roundabout sculptures were honored by Americans for the Arts as among the 37 most innovative approaches to Public Art in the country. Fuerteventura, Canary Islands (Spain); Local government displayed sculptures at several roundabouts. Many countries in Europe (France first, but also Germany, Austria, Italy, Spain, and others) show the widespread use of roundabouts as art installations. An inventory of roundabouts in France, made by Marc Lescuyer, listed 3,328 roundabouts with artistic decor early in 2010. The Minerva Roundabout in Guadalajara, Mexico is one of the city's most famous monuments. It features the goddess Minerva standing on a pedestal, surrounded by a large fountain, with an inscription saying "Justice, wisdom and strength guard this loyal city". The Garces Memorial Circle in Bakersfield, California contains a statue to Father Francisco Garces. This roundabout in Shanghai, China, has a pedestrian bridge in the form of another, raised roundabout. For larger roundabouts, pedestrian islands at each entry/exit encourage drivers to slow and prepare to enter the circle. They also provide a refuge where pedestrians may pause mid-crossing. Crosswalks at each entry/exit may be located at least one full car length outside the circle. The extra space allows pedestrians to cross behind vehicles waiting to enter the circle, and to allow exiting vehicles to stop for pedestrians without obstruction. Each crosswalk may traverse a pedestrian island for protection that also forces drivers to slow and begin to change direction, encouraging slower, safer speeds. On the island, the crosswalk may become diagonal, to direct the gaze of those crossing into exiting traffic. Physically separated bikeways best protect cyclists. Less optimally, terminating cycle lanes well before roundabout entrances require cyclists to merge into the stream of motor traffic, but keeps cyclists in full view of drivers, at some cost in motor vehicle speed. Cyclists may also be permitted to use the crosswalks. Traditional cycle lanes increase vehicle/bicycle collisions. When exiting, a motorist must look ahead to avoid colliding with another vehicle or with pedestrians on a crosswalk. As the intersection curves away from the exit, the path of an exiting vehicle is relatively straight, and so the motorist may often not slow substantially. To give way to a cyclist on the outside, requires the exiting motorist to look toward the rear, to the perimeter. Other vehicles can obstruct the driver's view in this direction, complicating the motorist's task. The more frequent requirements for motorists to slow or stop reduce traffic flow. A 1992 study found that the risk to cyclists is high in all such intersections, but much higher when the junction has a marked bicycle lane or sidepath around its perimeter. Cycle lanes were installed at Museum Road, Portsmouth, but were replaced by a narrowed carriageway to encourage lane sharing. The roundabout at the Brown Road/202 interchange adopts a U.S.-recommended design. On-street pavement markings direct cyclists to enter the sidewalk at the end of the bike lane. Cyclists who choose to travel on the wide sidewalk, cross roundabout arms perpendicularly, well outside the circle. A pedestrian island allows pedestrians and cyclists to cross one lane at a time. The Hovenring bicycle roundabout in the Netherlands is an innovative design, completely separating bicycles from vehicular traffic. Cycle lanes on St. John's roundabout in Newbury, Berkshire, England. Pavement markings invite cyclists to enter sidewalk on approach to roundabout in Mesa, Arizona. Cyclists are still permitted to use the roundabout like any other vehicle. Cyclists can choose to ride on the sidewalk on far right, or in main lanes of this roundabout in Mesa, Arizona. Roundabouts can increase delays in locations where traffic would otherwise often not be required to stop. For example, at the junction of a high-volume and a low-volume road, traffic on the busier road would stop only when cross traffic was present, otherwise not having to slow for the roundabout. When the volumes on the roadways are relatively equal, a roundabout can reduce delays, because half of the time a full stop would be required. Dedicated left turn signals (in countries where traffic drives on the right) further reduce throughput. Roundabouts have been found to reduce carbon monoxide emissions by 15–45 percent, nitrous oxide emissions by 21–44 percent, carbon dioxide emissions by 23–37 percent and hydrocarbon emissions by 0–42 percent. Fuel consumption was reduced by an estimated 23–34 percent. Major research on roundabout capacity has been carried out in multiple countries. Software can help calculate capacity, delay and queues. Packages include ARCADY, Rodel, Highway Capacity Software and Sidra Intersection. ARCADY and Rodel are based on the Transport Research Laboratory mathematical model. The TRL approach is derived from empirical models based on geometric parameters and observed driver behaviour with regard to lane choice. Sidra Intersection software includes roundabout capacity models developed in Australia and the US. Research on Australian roundabouts was conducted in the 1980s at the Australian Road Research Board (ARRB). Its analytical capacity and performance models differ from the TRL model significantly, following a lane-based gap-acceptance theory including geometric parameters. Research on U.S. roundabouts sponsored by the Transportation Research Board (TRB) and Federal Highway Administration (FHWA) culminated in a capacity model that was included in the Highway Capacity Manual (HCM) Edition 6 and the TRB-FHWA Roundabout Informational Guide (NCHRP Report 672). The HCM Edition 6 model is based on lane-based gap-acceptance theory. A recent NCHRP survey of US state transport agencies found that Sidra Intersection is the most widely used software tool in the US for roundabout analysis. A typical trunk road roundabout in the UK at Carland Cross on the A30 in Cornwall. There is a free-flow lane for the A30 towards Bodmin (nearest the camera). Statistically, modern roundabouts are safer for drivers and pedestrians than both traffic circles and traditional intersections. Roundabouts are safer than both traffic circles and junctions—experiencing 39% fewer vehicle collisions, 76% fewer injuries and 90% fewer serious injuries and fatalities (according to a study of a sampling of roundabouts in the United States, when compared with the junctions they replaced). Some larger roundabouts take foot and bicycle traffic through underpasses or alternate routes. Clearwater Beach, Florida's multi-lane roundabout has reduced its previously high cyclist death rate to zero since its construction. The most common roundabout crash type for cyclists, according to the New Zealand study, involves a motor vehicle entering the roundabout and colliding with a cyclist who already is travelling around the roundabout (50%+ of cyclist/roundabout crashes in New Zealand fall into this category). The next most common crash type involves motorists leaving the roundabout colliding with cyclists who are continuing farther around the perimeter. Designs that have marked perimeter cycle lanes were found to be even less safe, suggesting that in roundabouts, cyclists should occupy a vehicle lane or a separate path rather than a special lane. The researchers advised that drivers be forbidden from overtaking cyclists (as well as other vehicles) while in the circle. Poorly designed walkways increase risks for the vision-impaired, because it is more difficult than at a signalised intersection to audibly detect whether there is a sufficient gap in traffic to cross safely. At a signalised intersection, traffic comes to a stop, and an audible sound can be generated to indicate that it is time to cross. This issue has led to a conflict in the United States between the vision-impaired and civil engineering communities.[where?] One solution is to provide manually-operated pedestrian crossing signals at each entry. This increases construction and operation costs, and requires some way to disrupt traffic long enough for the pedestrian to cross (such as a HAWK beacon) that defeats the purpose of the roundabout. Signalisation also increases delays for most pedestrians during periods of light traffic, since pedestrians need to wait for a signal to change before (legally) crossing. Signalised pedestrian crossings are normally used on large-diameter roundabout interchanges rather than small-diameter modern roundabouts. Large roundabouts such as those used at motorway junctions typically have two to six lanes and may include traffic lights to regulate flow. Some roundabouts have a divider, or subsidiary deflection island, by means of which is provided a "free flow" segregated left (or right) turn lane (for the UK see Design Manual for Roads and Bridges TD 51/03) between traffic moving between two adjacent roads, and traffic within the roundabout, enabling drivers to bypass the roundabout. The term "gyratory" (for example, Hanger Lane gyratory) is sometimes used in the United Kingdom for a large circular intersection with non-standard lane markings or priority arrangements, or when there are significant lengths of carriageway between the entry arms, or when buildings occupy the central island. In the 21st century several of the gyratory systems in London have been removed, including Tottenham Hale and Elephant & Castle. As the overall or external size of a roundabout (in the UK referred to as the Inscribed Circle Diameter – ICD) is reduced, so the maximum practicable (and prescribed) diameter for the central island is also reduced, whilst the width of the circulatory carriageway increases (due to the greater width of vehicle swept path at smaller turning radii). In most cases this results in it being too easy – certainly when traffic is light relative to capacity – for drivers to traverse the roundabout at relatively high speed, with scant regard for road markings or the potential dangers to self or conflicts with other road users. To mitigate this risk, a proportion of the circulatory carriageway – an annulus around the central island – is segregated from general use by demarcation lines and differentiated from the outer annulus of carriageway by a combination of slightly raised surface, adverse crossfall, contrasting colours and textures and demarcating lines. The effect of this is to discourage drivers from taking a more direct path through the roundabout, their line of least resistance being more tightly curved (and therefore slower) but more bearable. The inner annulus provides for the trailing axles of longer or articulated vehicles to sweep across the inner annulus, which is therefore known as an over-run area (in UK usage), truck apron, or mountable apron. The smaller the roundabout, the more such mitigation measures are likely to be abused – the less effective they will be. In the UK the minimum size for roundabouts with raised islands is 28 metre diameter ICD with a 4-metre diameter island. This threshold being driven primarily by vehicle geometry – which is globally relatively consistent – rather than driver behaviour, it is adopted in other jurisdictions too. Below this minimum size, the mini-roundabout prevails. After developing the offside priority rule, Frank Blackmore, of the UK's Transport Research Laboratory, turned his attention to the possibility of a roundabout that could be built at sites lacking room for a conventional roundabout. A mini-roundabout in the United Kingdom, where a painted white circle is used for the centre. The arrows show the direction of traffic flow. Mini-roundabouts can be a painted circle or a low dome but must be fully traversable by vehicles. Motorists can drive over them when there is no other traffic, but it is dangerous to do so otherwise. Once the practice is established it may be difficult to discourage. Mini-roundabouts use the same right-of-way rules as standard roundabouts, but produce different driver behaviour. Mini-roundabouts are sometimes grouped in pairs (a double mini-roundabout) or in "chains", simplifying navigation of otherwise awkward junctions. In some countries road signs distinguish mini-roundabouts from larger ones. Mini-roundabouts are common in the UK, Ireland and Hong Kong (particularly on Hong Kong Island), as well as Irapuato in Mexico. Kemptville, Ontario, had the record for the most roundabouts in Ontario (with a record of three on one highway) until they recently began to become more prominent throughout many cities of the province at major intersections. In the UK and also in other jurisdictions that have adopted mini-roundabouts, to drive across the central disc or dome when it is practicable to avoid it is an offence. Vehicles are required to treat the painted circle as if it were a solid island and drive around it. Some local authorities paint double white lines around the circle to indicate this, but these require permission from the Secretary of State for Transport. The central dome also must be able to be overrun by larger vehicles. In the UK – and also in other highway jurisdictions – the maximum size for a mini roundabout is 28 metre ICD (inscribed circle diameter). A hybrid raindrop roundabout in Zagreb, Croatia, 45°48′33″N 15°59′55″E﻿ / ﻿45.809296°N 15.998648°E﻿ / 45.809296; 15.998648. These two roundabouts are more akin to a "magic roundabout" since the left turns need not drive through both of them. These roundabouts do not form a complete circle and have a raindrop or teardrop shape. They appear at U.S. Interstate interchanges to provide a free-flowing left turn to the on-ramps and eliminating the need for turn signals and lanes. Since the entry and exit slip roads are one-way, a complete circle is unnecessary. This means that drivers entering the roundabout from the bridge do not need to give way, and that prevents queuing on narrow, two-lane bridges. These roundabouts have been used at dumbbell roundabout junctions, replacing traffic signals that are inefficient without a turning lane. Several junctions along Interstate 70 near Avon, Colorado use teardrop roundabouts. A balcony roundabout is just an elevated roundabout. They are constructed in such a way that vulnerable road users can go underneath the roundabout and choose the direction they want to go. Footpaths and cycle paths along the different roads connect to the square under the roundabout. Vulnerable road users do not interfere with other traffic on the roundabout, making them much safer for them. In the Netherlands, Belgium, the United Kingdom, Spain, Poland, Hungary, Slovenia, the Czech Republic, and North Macedonia a relatively new type of two-lane roundabout designs is emerging, called "turbo roundabouts". These designs require motorists to choose their direction before entering the roundabout, thereby eliminating many conflicting paths and choices on the roundabout itself, so that traffic safety is increased, as well as speed and capacity. These designs, seen from above, typically result in a spiralling flow of traffic, giving them the collective name of turbo roundabouts. As a minor drawback turbo roundabouts are often marked out such that a U-turn by means of the roundabout is not possible for drivers approaching on certain arms. Several variations of turbo roundabouts exist. They are frequently designed for the intersection of a major road crossing a road with less traffic. An early application of the principle was a six-arm and therefore relatively large (and fast) non-circular roundabout at Stairfoot, Barnsley, South Yorkshire, which was given spiral marking about 1984. At that time the method was considered experimental and needed special consents from central authorities. The turbo roundabout was formally developed in 1996 in the Netherlands by Lambertus Fortuijn, a researcher from the Delft University of Technology. Similar roundabouts, with spiralling lane markings, have been used for many years in the UK e.g. the A176/A127 (eastbound) at Basildon, Essex (51°33′41″N 0°27′11″E﻿ / ﻿51.561399°N 0.452934°E﻿ / 51.561399; 0.452934). However it was not until 1997 that the UK's national highway authorities published guidance (DMRB TA-78/97) that in effect endorsed use of spiral markings in certain circumstances. Turbo roundabouts can be built with raised lane separators (common in the Netherlands) or with lane markings only. The use of raised lane separators prevents road users from switching (thereby reducing conflicts) but can make maneuvering for large vehicles more difficult. According to simulations, a two-lane roundabout with three exits should offer 12–20% greater traffic flow than a conventional, three-lane roundabout of the same size. The reason is reduced weaving that makes entering and exiting more predictable. Because there are only ten points of conflict (compared with 8 for a conventional single lane roundabout, or between 32 and 64 with traffic signal control), this design is often safer as well. Research and experiments show that traffic accidents are reduced by 72% on turbo roundabouts compared to multi-lane roundabouts, which have 12 points of conflict. Research at Windesheim University also shows that turbo roundabouts reduce accidents including casualties by some 75% when compared to regular intersections, and by 61% compared to single-lane roundabouts. The same research made it very clear that it is safer for cyclists not to have priority over motor vehicles on the roundabout, than to have it. At least 70 have been built in the Netherlands, while many turbos (or similar, lane splitting designs) can be found in southeast Asia. Multi-lane roundabouts in the United States of America are typically required to be striped with spiral markings, as most states follow the federal Manual on Uniform Traffic Control Devices. Roundabouts are generally not appropriate for placement on motorway or freeway mainlines because the purpose of such facilities is to provide for uninterrupted traffic flow. However, roundabouts are often used for the junction between the slip roads (ramps in North America) and the intersecting road. A single roundabout, grade separated from the mainlines, may be used to create a roundabout interchange. This type of junction is common in the UK and Ireland. Alternatively, separate roundabouts also may be used at the slip road intersections of a diamond interchange to create what often is referred to as a "dumbbell interchange", which is increasingly common in both Europe and North America due to its reduced need for wide or multiple bridges. An additional use of roundabouts for high-speed junctions is the 3-level stacked roundabout—this is a roundabout interchange where both of the roadway mainlines are grade separated. In the United Kingdom, the M25/A3, M8/M73 and A1(M)/M18 interchanges are examples of this type. These junctions, however, have less capacity than a full free-flow interchange. A similar design to this is the three-level diamond interchange. Most junctions on Dublin's M50 motorway C-road were built using a standard roundabout interchange. The traffic volume of several of these junctions increased to a level higher than the capacity such roundabouts can accommodate, and in turn have been converted into partially or fully free flowing interchanges. One example is the Red Cow interchange. In Northern Ireland, the junction between the M1 and M12 (Craigavon connector motorway) is via a standard roundabout with a raised centre, three onslips and three offslips, and two lanes. In the city of Malmö, Sweden, a roundabout connects two motorways, E22 from Lund, and the Inner ring road. In the Netherlands, A6 motorway and A7 motorway used to cross near Joure using a roundabout until October 2017, when the junction was turned into a full Y-interchange . The junction between the A200 and the A9 uses a 3-level stacked roundabout. Near Eindhoven (the Leenderheide junction), the junction for the A2 uses a roundabout. An overpass was built for the A67 from Antwerp to Germany. Rotary interchanges operate with traffic circles rather than roundabouts. Rotary interchanges are common in New England, particularly in the state of Massachusetts, but a European example of a rotary interchange may be found in Hinwil, Switzerland. 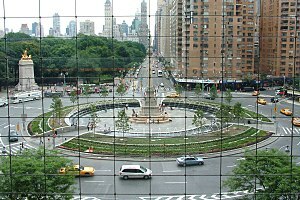 Columbus Circle in New York City. Unlike a modern roundabout, the circle is quite large and pedestrians have access to the center island. Access is controlled by traffic lights. A major signal-controlled roundabout interchange in central Bristol, England. Vehicles drive on the left, and vehicles in the roundabout are stopped by traffic lights to allow other vehicles to enter, while an underpass permits straight-through traffic to bypass the roundabout entirely. Some bridges on Beijing's Second Ring Road are controlled by traffic lights. While it may appear to defy the logic of roundabouts, it works well to control traffic flow on bridges, which are two viaducts creating a roundabout suspended over the ring road. Signal controlled roundabouts are common in the United Kingdom, Ireland, Spain (mostly the city of Valencia) and Mexico, where they have been introduced in an attempt to alleviate traffic problems at over-capacity roundabout junctions or to prevent some flows of traffic dominating others (around the M50 in Dublin for example). The Cherry Street roundabout in Kowloon, Hong Kong is also one such example. Another example is Sheriffhall Roundabout in Edinburgh, Scotland. Many of the roundabouts along the Paseo de la Reforma in Mexico City are signal-controlled. "Magic roundabouts" direct traffic in both directions around the central island. They are officially known as "ring junctions". The first magic roundabout was constructed in 1972 in Swindon, Wiltshire, United Kingdom, designed by Frank Blackmore, inventor of the mini-roundabout. The roundabout joins five roads and consists of a two-way road around the central island, with five mini-roundabouts meeting the incoming roads. The name derives from the popular children's television series, The Magic Roundabout, and is considered "magic" because traffic flows in both clockwise and anticlockwise directions. This is achieved by surrounding the main island with one smaller roundabout per entry/exit street. This pattern directs traffic in the usual clockwise (in LHT installations) or counter-clockwise (in RHT installations) manner around each mini-roundabout. Exiting the mini-roundabouts, traffic may proceed around the central island either in the usual direction (via the outer loop), or in the inverse direction (the inner loop). The arrangement offers multiple paths between feeder roads. Drivers typically choose the shorter, most fluid route. Although the safety record is good, many drivers find this system intimidating, and some drivers go to great lengths to avoid them. 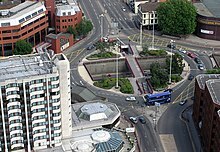 Similar systems are found in the Moor End roundabout in Hemel Hempstead (Hertfordshire), which has six intersections; in High Wycombe (Buckinghamshire), the Denham Roundabout in Denham (Buckinghamshire), the Greenstead Roundabout in Colchester (Essex), "The Egg" in Tamworth (Staffordshire) and the Hatton Cross Roundabout in London. Churchbridge Junction in Staffordshire is a magic gyratory. This type of junction is similar to a magic roundabout, except that the constituent roundabouts are connected by longer lengths of roadway. Tram roundabouts, which are found in many countries, merge roundabouts for individual vehicles with tram lines. Large areas are needed for tram roundabouts that include a junction between tram lines. Such systems often contain tram stops. Tram rails usually cross roundabouts in the center. This requires traffic lights or special signalling granting the trams priority. However, there are also roundabouts where trams and vehicles use the same lane. Some roundabouts have a tram stop on their island. In inner Melbourne, particularly in the inner suburban area of South Melbourne, where the tram network is extensive, tram tracks always pass through the central island, with drivers required to give way to vehicles approaching from their right and to trams approaching from right-angles. The Haymarket roundabout between Royal Parade and Elizabeth Street contains a tram-stop, pedestrian crossings, three entering tram lines, traffic signals to stop vehicular traffic at each crossing point when a tram is due, service roads and a pedestrian crossing. Brussels tram roundabouts employ multiple configurations. At the Barrière de St-Gilles/Bareel St-Gillis, tram tracks form a circle in the carriageway, while Verboekhoven and Altitude Cent/Hoogte Honderd have reserved tram tracks inside the roundabout. At Place Stéphanie/Stefaniaplein, they go straight through the center, with a slip track up the Chaussée de Charleroi/Charleroisesteenweg, while at Montgomery they tunnel underneath. In Dublin, Ireland, the Red Cow interchange at the N7/M50 junction is grade-separated and is signal-controlled with secondary lanes (separate from the main roundabout) for those making left turns. The junction, the busiest in Ireland, had tram lines added to it with the opening of the Luas system in 2004. The tracks pass across one carriageway of the N7, and across the southern M50 sliproads. Trams pass every five minutes at rush hour. The roundabout was replaced with a grade-separated free flowing junction. Gothenburg, Sweden has a tram roundabout and tram stop at Korsvägen (the Crossroad). It carries heavy vehicular traffic and about one tram or bus per minute passes in several directions. This is further complicated by separated rights-of-way for trams and buses and the fact that it is one of the busiest interchanges in the city. Another one is located at Mariaplan in the inner suburb of Majorna. The trams makes a right turn, giving the roundabout an odd design. In Warsaw, trams typically cross straight through roundabouts, and have junctions in the center of them. In Wrocław, Poland, trams pass through the Powstańców Śląskich Roundabout, stopping in the roundabout (north-headed track). The Silesian tram network in Poland has two tram roundabouts. In the city centre of Katowice, the tram line passes through the center of the Ziętka Roundabout in a north-south alignment, with a tram stop in the center of the circle. [a] In Będzin, unusually, the tram junction itself forms a circular roundabout, with trams going around the circle; there are tram stops immediately outside the roundabout on each branch. In Vítězné náměstí (Victory Square) in Prague, Czech Republic, a tramway crosses the carriage way of the roundabout at three places. Entering as well as leaving trams give way to vehicles. In the years 1932–42 trams circulated much like vehicles. In Kiev, Ukraine an interchange of two "fast tram" lines is below a roundabout. Oslo, Norway also has many roundabouts with tram tracks passing through; for example at Bislett, Frogner plass, Sinsen, Solli plass, Carl Berners plass and Storo. In Wolverhampton, England, the Midland Metro tram passes through the centre of a roundabout on approach to its terminus at St. Georges. This also happens in New Addington on the Tramlink on Old Lodge Lane at the junction to King Henry's Drive. In Sheffield, England the Sheffield Supertram systems crosses two major roundabouts. At the Brook Hill roundabout near Sheffield University, the tramway passes underneath the roundabout in a subway, while at Park Square in the city centre it travels above the roundabout on bridges and viaducts with a junction in the central island. In Salt Lake City, Utah a light rail line on the south side of the University of Utah crosses a roundabout where Guardsman Way meets South Campus Drive. Like virtually all rail crossings in the United States, both crossings in the circle are equipped with boom barriers. In Kassel, Germany, Lines 4 and 8 pass through the center of the roundabout at Platz der Deutschen Einheit. The tram stops are in the center of the roundabout. Roundabout traffic is controlled by traffic lights. Pedestrian access is via subway and street level crossings at the lights. In Bremen, Germany, tram lines 8 and 6 pass through the center of the roundabout "Am Stern" east of the main railway station. They enter from the west and exit in a northeastern direction thus making a slight bend within the roundabout. Both stations are situated on the north-eastern edge of the roundabout. Traffic is controlled by two-colour traffic lights inside the roundabout. In Antalya, Turkey, there are four tram roundabouts; while the tram line is grade-separated from two of them, named Anadolu and Çallı. In Oldham, England, the Metrolink line to Rochdale crosses a roundabout that was originally built as part of a town centre bypass. The whole road level had to be lowered to enable the tram overhead power wire to pass under the bypass flyover. The trams have priority and the traffic lights change accordingly as a tram approaches. A "throughabout" was also added to enable traffic heading in one direction onto the bypass to avoid being held by the tram. In Jensen Beach, Florida, the main line of the Florida East Coast Railway running north-south bisects the two-lane roundabout at the junction of Jensen Beach Boulevard running east–west. It hosts three other roads and the service entrance to a large shopping plaza. Boom barriers line the railway crossings. The landscaped central island bisected by the tracks was originally curbed/kerbed, but 18-wheelers had trouble negotiating the roundabout, so the curbs were replaced with painted concrete strips. The roundabout was built in the early 2000s and improved traffic flow, although long freight trains often cause delays. Two roundabouts in the Melbourne metropolitan area, Highett, Victoria and Brighton, have heavy rail crossing the roundabout and through the inner circle. Boom barriers protect the railway from oncoming traffic at the appropriate points in the roundabout. At the Driescher Kreisel in Bergisch Gladbach, Germany, a railway serving a nearby paper factory crosses a roundabout located next to a shopping centre and pedestrian zone. The flow of traffic and pedestrians is governed by 14 barriers, 22 traffic lights and 8 loudspeakers. The barriers close three times daily for 7 minutes to allow trains to pass. In New Zealand's South Island, two roundabouts join major roads where a railway cuts through. One is at the intersection between State Highway 1 (as Sinclair Street and Main Street from the east) and Main Street (from the west), Park Terrace and Redwood Street in the city of Blenheim. Here the Main North Line bisects the roundabout and separates Park Terrace and Main Street eastbound from the rest of the roundabout. The other roundabout is located at Kumara Junction on the West Coast, where the Hokitika Branch separates State Highway 6 southbound from SH 6 northbound and SH 73. Both roundabouts are controlled by flashing red lights, with additional boom barriers at the Blenheim roundabout. These resemble a typical roundabout but are signalised and have a straight-through section of carriageway for one of the major routes. The hamburger name derives from the fact that the plan view resembles the cross-section through a hamburger. The United Kingdom has examples on the A580 East Lancashire Road in St Helens, on Haydock Island in Merseyside (which also features the M6 passing overhead), and on the Astley/Boothstown border. More examples are the A6003 at Kettering, the A538 near Manchester Airport, the "Showcase" junction on A329 at Winnersh, Berkshire and the A63/A1079 Mytongate junction in Hull. Examples also exist in Bracknell, Hull, Bramcote in Nottinghamshire and Reading, as well as on the N2/M50 intersection in Dublin, Ireland. In Perth, Western Australia, one is found at the intersection of The Strand, Morley and Alexander Drives. Throughabouts are very common in Spain, where they are called raquetas (Spanish for "[tennis] racket") or glorieta/rotonda partida ("split roundabout"). A more advanced and safer version of a hamburger roundabout is a roundabout interchange, separating the straight roadway and using underpasses or overpasses to cross the roundabout itself. The same features that make roundabouts attractive for roadway junctions led to their use at junctions of multi-use trails. The University of California, Davis and Stanford University, as well as the Cape Cod and Old Colony rail trails have bicycle-pedestrian roundabouts. Roundabouts are used on off-road bicycle trails in Florida, Colorado, Alaska, and Wisconsin. An elevated roundabout is located in Eindhoven, serving pedestrian and bicycle traffic only, above the main conventional roadway intersection. It is known as the Hovenring. ^ There is also a branch line immediately north of the roundabout going west, and an additional tram stop on that branch. ^ "Roundabout Benefits". Washington State Department of Transportation. Retrieved 12 July 2014. ^ Hesch, Maxine. "Quantitatively Determining the Emissions Reduction Benefits of the Replacement of a Signalized Intersection by a Roundabout" (PDF). New York State Department of Transportation. Retrieved 6 October 2013. ^ a b c "Q&As". ^ "Roundabout Rules of the Road". Archived from the original on 9 January 2014. Retrieved 12 January 2014. ^ "B. Guichet - Roundabout Crashes in France". ^ "Was alles in Görlitz erfunden wurde - Alles-Lausitz.de". Alles-Lausitz.de (in German). Retrieved 2017-06-05. ^ BBC News (2 November 2004). "Roundabout Magic". Retrieved 13 May 2007. ^ Letchworth Garden City Heritage Foundation. "Sign of the Times". Archived from the original on 16 October 2006. Retrieved 14 December 2006. ^ Google. "Atherton, Ca." (Map). Google Maps. Google. ^ "WSDOT - Washington's Roundabouts". 11 October 2016. Archived from the original on 11 October 2016. Retrieved 17 October 2018. ^ "Frank Blackmore: traffic engineer and inventor of the mini-roundabout". The Times. London. 14 June 2008. Retrieved 15 June 2008. ^ Ourston Roundabout Engineering, Inc (13 January 2010). "Leif Ourston receives Frank Blackmore Award". Ourston.com. Archived from the original on 29 October 2013. Retrieved 7 October 2013. ^ a b Keh, Andreh (18 November 2010). "European Import Has Cars Spinning. Heads, Too". The New York Times. Retrieved 19 November 2010. ^ Tom Geoghegan (2011-07-01). "Is the British roundabout conquering the US?". BBC website. Retrieved 2011-07-01. ^ Retting, Richard A.; Kyrychenko, Sergey Y.; McCartt, Anne T. (2007). "Long-Term Trends in Public Opinion Following Construction of Roundabouts". Journal of the Transportation Research Board. 2019: 219–24. ^ Roselli, Dayna (18 April 2007). "Roundabouts". lasvegasnow.com. Archived from the original on 26 March 2012. Retrieved 14 October 2014. ^ "What lane should I use on a roundabout?". AXA.ie. AXA. 16 November 2017. Retrieved 16 November 2017. ^ Capuzzo, Jill P. (25 November 2007). "A Shift, but for Some Drivers, a Vicious Circle". The New York Times. Retrieved 27 March 2010. ^ Google. "Drum Hill Rotary" (Map). Google Maps. Google. ^ U.S. Department of Transportation 2013, para 1.5. ^ "Safety Aspects of Roundabouts - FHWA Safety Program". 3 September 2014. Archived from the original on 3 September 2014. Retrieved 17 October 2018. ^ "General Law - Part I, Title XIV, Chapter 89, Section 8". malegislature.gov. Retrieved 17 October 2018. ^ "Rhode Island Driver's Manual" (PDF). Dmv.ri.gov. Retrieved 17 October 2018. ^ "Intersection Safety Roundabouts - Safety - Federal Highway Administration". Safety.fhwa.dot.gov. Retrieved 17 October 2018. ^ Kittleson & Associates. "Kansas Roundabout Guide: A Supplement to FHWA's Roundabouts: An Informational Guide" (PDF). Kansas Department of Transportation. Retrieved 26 August 2009. ^ Commonwealth of Massachusetts, Registry of Motor Vehicles. "Sharing the Road: A User's Manual for Public Ways". Retrieved 2009-05-13. ^ "Vehicle & Traffic Law - Right of Way". 3 July 2011. Archived from the original on 3 July 2011. Retrieved 17 October 2018. ^ a b c "Index - Roundabout: An Informational Guide, June 2000 - FHWA-RD-00-067". Fhwa.dot.gov. Retrieved 17 October 2018. ^ Shashi S. Nambisan, Venu Parimi (March 2007). "A Comparative Evaluation of the Safety Performance of Roundabouts and Traditional Intersection Controls". Institute of Transportation Engineers. Retrieved 2007-11-27. ^ "Art In Public Places, Bend, Oregon". Art in Public Places. Archived from the original on 9 May 2008. Retrieved 2 November 2013. ^ "Pillar of art" (PDF). Art in Public Places. Archived from the original (PDF) on 3 November 2013. Retrieved 2 November 2013. ^ "Fuerteventura, art on the roads: roundabouts as galleries". Roberto Alborghetti. Retrieved 2 November 2013. ^ Google. "Photographs of French roundabouts" (Map). Google Maps. Google. ^ a b c Google. "Roundabout photographs from The Netherlands, Belgium, Germany and Austria" (Map). Google Maps. Google. ^ Google. "Roundabout photographs from Italy" (Map). Google Maps. Google. ^ Google. "Roundabout photographs from Spain" (Map). Google Maps. Google. ^ a b "Unusual road roundabouts: artistic, and otherwise. A collection of more than 2000 photographs, by almost 200 amateur photographers, from all over the world". Panoramio: Roundabouts. www.panoramio.com. Retrieved 2 November 2013. ^ "Roundabout / Kreisverkehr – streets with a roundabout / Straßen mit einem Kreisverkehr" (in English and German). www.flickr.com. Retrieved 2 November 2013. ^ "Inventory of French roundabouts" (in French). Marc Lescuyer. Archived from the original on 11 November 2008. Retrieved 1 January 2010. ^ a b "Modern Roundabouts, an Informational Guide". Federal Highway Administration Research and Technology. Retrieved 15 September 2015. ^ "FHWA - MUTCD - 2003 Edition Chapter 3B2". ^ Vortragsfolien Radverkehr Scroll to the section labelled "Kreisverkehr". A translation of the text reads: Graphic from Sicherung von Radfahrern an städtischen Knotenpunkten [Safeguarding cyclists in Urban Intersections], (BASt, 1992). Accident numbers in large circular junctions with different bicycle facilities show: 1. Why there should be no pathways or bike lanes at these junctions; 2. Even when cyclists use the roadway, their risk is relatively high at these junctions. ^ Maycock, G., and Hall, R. D. (1984). "Accidents at 4-Arm Roundabouts." TRRL1120, Transport and Road Research Laboratory (TRRL), Crowthorne, England. ^ TRB (2016). Highway Capacity Manual, Sixth Edition: A Guide for Multimodal Mobility Analysis. Transportation Research Board, National Research Council, Washington, DC, USA. ^ TRB. Roundabouts: An Informational Guide. NCHRP Report 672. Transportation Research Board, National Research Council, Washington, D.C., USA, in cooperation with US Department of Transportation, Federal Highway Administration. ^ TRB (2016). "Roundabout Practice, A Synthesis of Highway Practice". National Cooperative Highway Research Program, NCHRP SYNTHESIS 488. Washington DC, USA. ^ Richtmeyer, Richard (6 January 2008). "Safer Roundabouts Sprouting Up All Over New York, Nation". Associated Press. Archived from the original on 15 December 2012. Retrieved 10 January 2008. ^ "Crash analysis system". Retrieved 29 November 2007. ^ Bill Baranowski, P.E., Pedestrian Crosswalk Signals at Roundabouts: Where are they Applicable? ^ "History of Roundabouts". Archived from the original on 27 January 2008. Retrieved 29 November 2007. ^ Rhodes, Belinda (21 June 2008). "Frank Blackmore Determined, maverick traffic engineer who invented the mini-roundabout". The Guardian. Retrieved 7 October 2013. ^ Google. "Teardrop roundabout in Avon, Co." (Map). Google Maps. Google. ^ "Turborotonde en turboplein: ontwerp, capaciteit en veiligheid" [Turbo Roundabout and Turbo Circle; Design, Capacity and Safety] (in Dutch). Delft University of Technology. 8 January 2013. Retrieved 16 October 2014. ^ "Benefits of Turboroundabouts". Transoft Solutions Inc. 2014. Retrieved 16 October 2014. ^ a b Vos, Christiaan (2016-01-31). "Effecten realisatie turborotonde onderzocht" [Effects research of turbo roundabouts]. Verkeer - Verkeersveiligheid - Vorm (Traffic, Safety, Form) (in Dutch). Dirk de Baan. Archived from the original on 2017-01-28. Retrieved 2017-01-28. ^ Isaak Yperman; Ben Immers (2003). "Capacity of a turbo-roundabout determined by micro-simulation" (PDF). Katholieke Universiteit Leuven, Department of Civil Engineering – Transportation Planning and Highway Engineering. Archived from the original (pdf) on 2003. ^ "Manual on Uniform Traffic Control Devices for Streets and Highways – Part 3: Markings" (pdf). U.S. Department of Transportation – Federal Highway Administration. 2003. ^ "In Depth: The Magic Roundabout". CBRD. 22 November 2005. Archived from the original on 7 January 2012. Retrieved 12 January 2012. ^ 10 Scariest Junctions in the UK, BBC, 27 November 2009. ^ Google. "High Wycombe" (Map). Google Maps. Google. ^ Google. "Hatton Cross" (Map). Google Maps. Google. ^ "SABRE: Magic Gyratory". 8 November 2013. Retrieved 8 November 2013. ^ Google (15 January 2012). "Roundabout" (Map). Google Maps. Google. Retrieved 15 January 2012. ^ "Jensen Beach Roundabouts Charrette". ^ Google (15 January 2012). "Blenheim Roundabout" (Map). Google Maps. Google. Retrieved 15 January 2012. ^ Google (15 January 2012). "Kumara Junction Roundabout" (Map). Google Maps. Google. Retrieved 15 January 2012. ^ Google. "Haydock Island in Merseyside" (Map). Google Maps. Google. ^ Google. Astley/Boothstown border "Roundabout" Check |mapurl= value (help) (Map). Google Maps. Google. ^ Google. "Winnersh, Berkshire" (Map). Google Maps. Google. ^ Google. "Mytongate on the A63 in Hull" (Map). Google Maps. Google. ^ Google. "Morley and Alexander Drive" (Map). Google Maps. Google. ^ Google. "Davis, Ca." (Map). Google Maps. Google. ^ "Federal Highway Administration Research and Technology-- - Federal Highway Administration". Archived from the original on 23 September 2006. Retrieved 5 September 2006. ^ "Bicycle roundabout sits at intersection of 3 bike paths". The Capital Times. U.S. Department of Transportation (2013). "Roundabouts: an Informational Guide" (PDF). Wikimedia Commons has media related to Roundabouts. This page was last edited on 18 April 2019, at 02:22 (UTC).